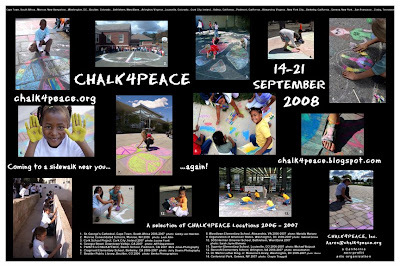 ONE MILLION ARTISTS CHALK4PEACE in 2008! Big Task. to making your donation stretch AROUND THE WORLD. CLICKING ON THE TITLE OF TODAY'S POSTING! 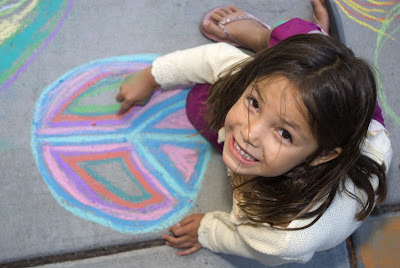 CHALK4PEACE has 501(c)(3) status; your donation is tax deductible. CHALK4PEACE says, "It's the ONLY one we've got!" Eco Tip: Take a Tote Bag to the market EVERY TIME YOU GO!!! Washington, D.C. photos: CHALK4PEACE, Inc.
longtime friend from back in the early Boulder days. He has helped CHALK4PEACE immeasurably. from more than one angle! His eye for the moment is one of the great visual joys in life. He brings out the CHALKSTAR in everyone! to catch artists at the height of their inspiration this September. click on the Title of Today's Posting. SUPPORT CHALK4PEACE! RECEIVE THE Official Limited Edition POSTER! one of our limited edition high resolution 2008 posters. Show your support 4 PEACE. BE A CHALKSTAR! to show your support 4 CHALK4PEACE! art chalk for distribution to our overseas friends who have little access to the colorful signature chalk you see in our photographs. 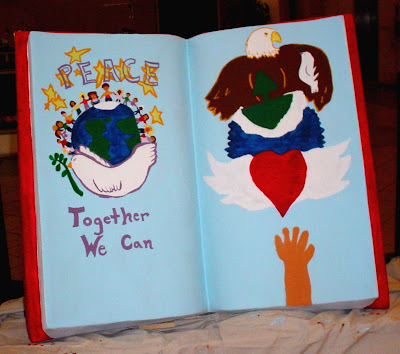 CHALK4PEACE is dedicated to encouraging others' dreams 4 peace. We ask you to help us continue our work to give peace its chance. celebrating CHALK4PEACE with support through promotional materials, CHALK, Internet presence and the C4P INFORMATION HOTLINE. 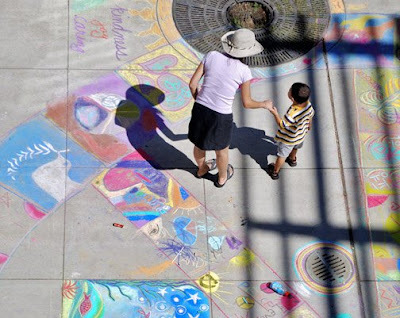 Every dollar effectively provides a young artist with chalk. more, if you wish. HELP US HELP A MILLION ARTISTS! We make sure YOUR dollar is used to promote the concept of peace. All the CHALK4PEACE artists everywhere thank you. 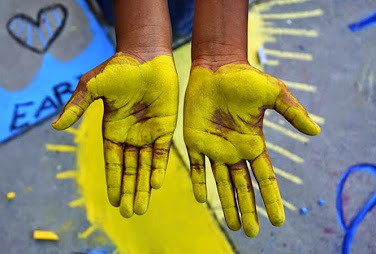 Photos: Jerry Downs Photography, CHALK4PEACE, Inc.
experience with CHALK4PEACE. Images were drawn from the event. Kathryn Vaughn is the artist/educator who inspired this project. What a tribute to PEACE. 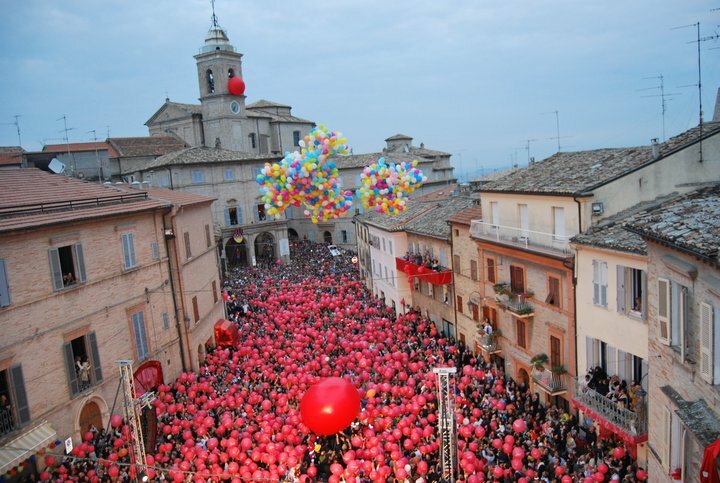 a large painted sculpture project similar to the cows in New York. and Humanities. This image conveys a timelessness rare in art today. This drawing created the need within me to initiate the project on a global basis. The artist is to be thanked immensely. Jefferson Memorial encouraging the world to support CHALK4PEACE. to get a glimpse of the Icon of world sport, the Olympic Torch. the Golden Gate Bridge, or to the airport. I went for ONE reason- I had never seen the Olympic Torch. I went with the naive spirit of doing it to honor Sport. athlete's autograph at the big game; and he doesn't show up. I feel like a sucker for believing I would get to see it. Sure fooled us, didn't they? Joke's on U.S.
people down at the route. It was proclaimed a rousing success. symbol that creates global confrontation. The Torch belongs to Sport. Not politics. I feel like a kid who didn't get that autograph. 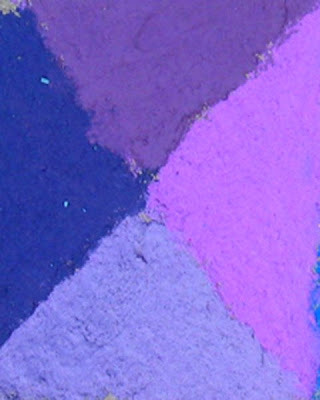 Official Color of CHALK4PEACE 2008...PURPLE!!! 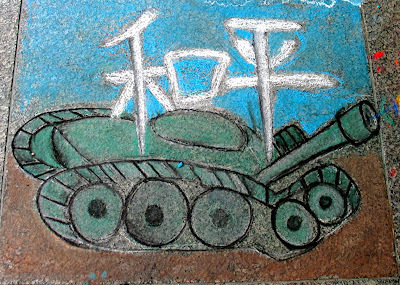 been named the Official Color of CHALK4PEACE 2008.
chalk when you are drawing, just mix RED and BLUE. young artists of the world. We never argue with them! 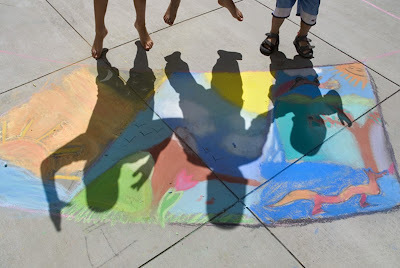 Marian Wright Edelman said, "Just keep moving..."
CHALK4PEACE- COMING AGAIN TO A SIDEWALK NEAR YOU! A man of peace left us forty years ago today. We still carry his Dream. Murphy, a homeless fellow, drew his rainbow at CHALK4PEACE '06. He told us it was the first time he'd been asked to think about peace. He said, "This is Dr. King's Library; and he was all about peace. All colors together. Thanks for making me a part of this. A rainbow is what I think of when I think of peace..."
We honor Dr. King and his efforts to bring everyone together. done at the Dr. Martin Luther King, Jr.
Memorial Library in Washington, DC, 2005-2007.
on the plaza in homage to Dr. King's vision.